Description: 1971's Play Family School followed behind 1968's #915 Farm, 1969's #952 House and 1970's #930 Garage, three favorites which proved a tough act to follow. The school was up to the task as it's intricately-constructed base continued the fine craftsmanship that marked the earlier Little People sets. Though it never quite joined the powerhouse trilogy of it's three forerunners (Farm, House, and Garage), it did enjoy a popular and long-running production career of seven years, making it an ideal set for beginning collectors. At 63 pieces, including the base and all the numbers and letters, it's also the Little People set with the most accessories, many of which made their first appearance in this set before going on to others. The school base itself was remodeled in the middle of it's run, trimming excess masonite around the walls of the base (probably because the corners easily broke off) and removing the lithograph underneath the lift-up flat. The lithograph on the other side of the roof was never removed, though with age, it had a tendency to fall off altogether and often got ripped off, making surviving bases more desirable with said lithograph intact. After production stopped in 1978 the school was given a brief revival (in name only) a decade later. 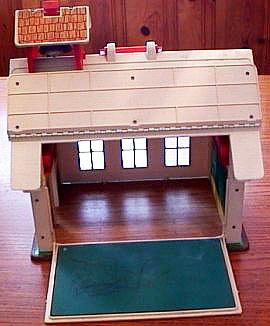 The playset was the #2550 Little People School, often dubbed, The New School. B923A - Red school building with a masonite base and a fold-down wall on the front that has a metal chalkboard on the inside. The roof above the fold-down wall has a flip-up flap with a paper litho on the underside. The roof is magnetic for the accessory magnetic letters to stick to it. The school building has a clock with red plastic movable hands above the door, and a bell on top of the roof beside the red carry handle. This base has more masonite on the edges than the B923B base. The corners of the masonite tend to break. The roof "steeple" has chrome-plated bell. FPT1013 - Off-white rectangular hard plastic storage tray that has individual slots for each letter A-Z. The top row holds letters A-G.
FPT1014 - Off-white rectangular hard plastic storage tray that is divided into three equal size compartments for mass storage of numbers/letters. This tray does not have molded indented spaces for storing individual letters or numbers. 1 each - FPT971 - Red letter "A". 1 each - FPT972 - Orange letter "B". 1 each - FPT973 - Yellow letter "C". 1 each - FPT974 - Green letter "D". 2 each - FPT975 - Blue letter "E". 1 each - FPT976 - Purple letter "F". 1 each - FPT977 - Red letter "G". 1 each - FPT978 - Orange letter "H". 2 each - FPT979 - Yellow letter "I". 1 each - FPT980 - Green letter "J". 1 each - FPT981 - Blue letter "K". 2 each - FPT982 - Purple letter "L". 1 each - FPT983 - Red letter "M". 2 each - FPT984 - Orange letter "N". 1 each - FPT985 - Yellow letter "O". 2 each - FPT986 - Green letter "P". 1 each - FPT987 - Blue letter "Q". 2 each - FPT988 - Purple letter "R". 2 each - FPT989 - Red letter "S". 2 each - FPT990 - Orange letter "T". 1 each - FPT991 - Yellow letter "U". 1 each - FPT992 - Green letter "V". 1 each - FPT993 - Blue letter "W". 1 each - FPT994 - Purple letter "X". 1 each - FPT995 - Red letter "Y". 1 each - FPT996 - Orange letter "Z". FPT1006 - Purple number "0". FPT997 - Yellow number "1". FPT998 - Green number "2". FPT999 - Blue number "3". FPT1000 - Purple number "4". FPT1001 - Red number "5". FPT1005 - Blue number "6" or "9". FPT1002 - Orange number "6" or "9". FPT1003 - Yellow number "7". FPT1004 - Green number "8". 4 each - FPT5 - Yellow 1-seat student school desk with an attached desk top - no litho. FPT2 - Green rectangular teacher's desk with a lithograph on top of an apple, papers, etc. FPT164 - Green single seat teacher's chair with a straight back and no side arms. The color of the chair matches the teacher desk, and this color should be opposite the color of the student desks. FPT8574 - Green swing set with 2 yellow swinging seats (1 single and 1 double seat) with a green base. FPT24 - Lime Green 2-step slide. Color matches teacher's desk and bases of other playground equipment. FPT1021 - Small blue box of chalk that holds 3 pieces of white chalk sticks. The box has a picture of a red-headed cartoon boy writing "CHALK ABC" within a red square beside him. 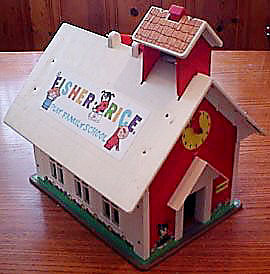 The sides of the box are marked "FISHER-PRICE®" in white block lettering. The back of the box is marked, "FISHERPRICE CHALK 3 STICKS NON-TOXIC #923 ©71 FISHERPRICE TOYS E. AURORA, N.Y. MADE IN U.S.A."
Red rectangular eraser with black foam. *This eraser must be a prototype for photos as we've never seen a red eraser in "circulation". *See "Variations" below. FNWW - Teacher - Blue mom with fancy eyes and a blonde ponytail. DLWW - Red Afro-American boy with black heat-stamped hair and a raised "belt" rim around his waist. QRWW - Green boy with red heat-stamped hair and a raised "belt" rim around his waist. FTWW - Green girl with freckles, "" eyebrows, and a red bob with bangs. FPT288 - Yellow rectangular hard plastic eraser with black foam on the bottom side. The top of the eraser is marked with a "FP" within circles imprint. The top of the eraser has a TEXTURED (stucco-type) finish. *See "Variations" below. FNWW or FNWP - Teacher - Blue mom with fancy eyes and a blonde ponytail. FTWW or FTWP - Green girl with freckles, "" eyebrows, and a red bob with bangs. B923B - Red school building with a masonite base and a fold-down wall on the front that has a metal chalkboard on the inside. The roof above the fold-down wall has a flip-up flap without a paper litho on the underside. The roof is magnetic for the accessory magnetic letters to stick to it. The school building has a clock with red plastic movable hands above the door, and a bell on top of the roof beside the red carry handle. The base has less masonite on the base edges than B923A base has. Roof "steeple" has chrome-plated bell. 4 each - FPT3 - Green 1-seat student school desk with an attached desk top - no litho. FPT4 - Yellow rectangular teacher's desk with a lithograph on top of an apple, papers, etc. FPT165 - Yellow single seat teacher's chair with a straight back and no side arms. The color of the chair matches the teacher desk, and this color should be opposite the color of the student desks. FPT6 - Yellow swing set with 2 green swinging seats (1 single and 1 double seat) with a green base. FPT22 - Yellow 2-step slide. Color matches teacher's desk and bases of other playground equipment). FNPP - Teacher - Blue mom with fancy eyes and a blonde ponytail. ITPP - Red Afro-American boy with black heat-stamped hair. FUPP - Green girl with freckles, "" eyebrows, and blonde braids. FPT22 - Yellow 2-step slide. Color matches teacher's desk and bases of other playground equipment. FPT288 - Yellow rectangular hard plastic eraser with black foam on the bottom side. The top of the eraser is marked with a "FP" within circles imprint. The top of the eraser has a TEXTURED (stucco-type) finish. *See "Variations" below. *See "Variations" below. FTPP - Green girl with freckles, "" eyebrows, and a red bob with bangs. 1971-1975 - B923A - Small litho on the underside of the part of the roof that flips up and the base has more masonite on the edges that tend to break. 1976-1978 - B923B - No litho on roof flap, less masonite on edges. FPT3 - Green 1-seat student school desk with an attached desk top - no litho. FPT5 - Yellow 1-seat student school desk with an attached desk top - no litho. Red rectangular eraser with black foam. FPT1022 - Yellow rectangular hard plastic eraser with black foam on the bottom side. The top of the eraser is marked with a "FP" within circles imprint. The top of the eraser has a SMOOTH finish. FPT288 - Yellow rectangular hard plastic eraser with black foam on the bottom side. The top of the eraser is marked with a "FP" within circles imprint. The top of the eraser has a TEXTURED (stucco-type) finish. FNWW - FNWP - FNPP - Teacher - Blue mom with fancy eyes and a blonde ponytail. FGWW - FGWP - Blue girl with blonde braids. FTWW - FTWP - FTPP - Green girl with freckles, "" eyebrows, and a red bob with bangs. Although this school set was discontinued in the USA in 1976, it stayed in production in other countries. It is pictured in the 1979 Dutch Fisher-Price Dealer Catalogue, and in the 1988 Fisher-Price Swedish dealers catalogue right beside the #2500 Main Street, the #2501 Farm, #2504 Garage (blue ramp), and other late model sets. Perhaps it was a catalogue photo error?